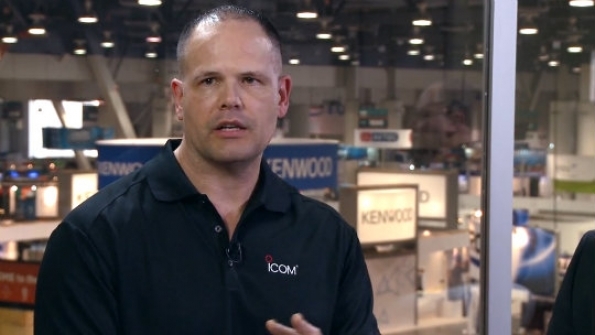 Mark Jordan, Icom America's technical channel manager, explains how the company's IP100 advanced radio system lets enterprises resolve in-building coverage issues by leveraging Wi-Fi systems that do not require licensed spectrum. Mark Jordan, Icom America’s technical channel manager, explains how the company’s IP100 advanced radio system lets enterprises resolve in-building coverage issues by leveraging Wi-Fi systems that do not require licensed spectrum. Although the solution operates on unlicensed spectrum, encryption and quality-of-service assurances can be implemented. Key components of the solution are the IP100H radio, one of the smallest professional radios on the market (about 3.7 inches long and weighing 7.2 ounces), and the IP1000C controller, which enables individual or group calls, as well as full-duplex communication. For more information about the IP100 solution, visit this page on the company’s web site. For more information about Icom, visit www.icomamerica.com.